Entry price, high-end gaming. Lenovo's latest Y Series has the best of both worlds: Sleek, thin looks with exceptional performance for a very fair starting price of $1050. Though the notebook is marketed as an entry-level portable gaming machine, we believe even serious gamers should take a look at what the new Y50 has to offer. Our in-depth look at last year's IdeaPad Y500 and Y510p proved very popular, but the fact that a largely business-centric manufacturer like Lenovo can establish a successful gaming lineup so quickly was equally surprising and out of left field. This year's IdeaPad Y50 continues the trend with some major updates to both the exterior and interior while keeping the recognizable brushed metal and red trims of the last generation intact. 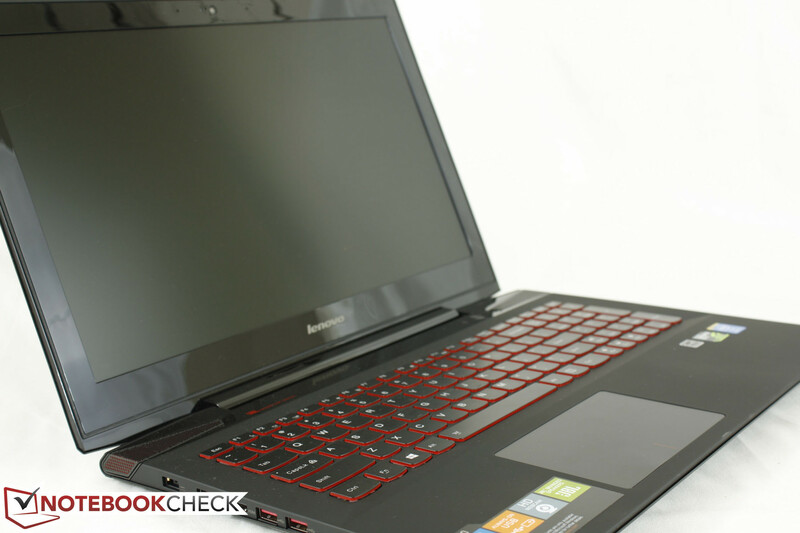 Our test model is powered by a Core i7-4700HQ with 16 GB RAM, a 1 TB SSHD, an Nvidia GTX 860M, and a 15.6-inch 1080p display. 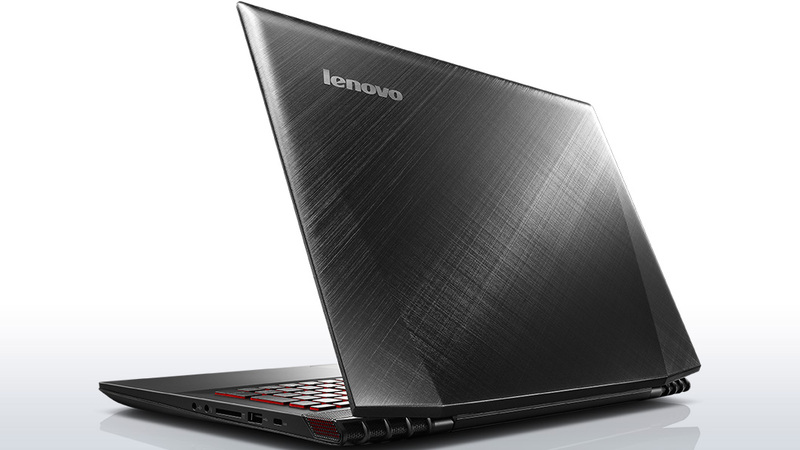 While Lenovo offers additional configurations, all models are equipped with a GTX 860M GPU and matte FHD screen. The lowest priced model comes in at just $1050. It is worth noting that some models are equipped with a 4 GB GTX 860M instead of the 2 GB variant, while only the highest-end model comes pre-loaded with an SSD in lieu of the SSHD. A separate Y50 UHD series offers ultra-high resolution glossy displays for 2160p gaming. Aside from the obvious configuration differences and the update to Nvidia's 8xxM series compared to the last Y500 generation, the new Y50 is overtly lacking the UltraBay slot for SLI performance. As a direct result, weight and thickness have both been cut significantly. Is the potential performance sacrifice worth the improved mobility and looks? Or can the more powerful single GTX 860M compensate for the dual GT 650M and dual GT 750M setups of the Y500 and Y510p, respectively? Our data and analyses below speak for themselves. The chassis here is a confounding combination of at least three or four different dark gray and black surfaces and textures, yet the overall final look still manages to be visually appealing and sharp against other slim gaming notebooks including the Razer 14, Aorus X7 or MSI GS60 Ghost. The glossy brushed metal outer lid and bottom panel, matte rubberized palm rests, and glossy plastic display frame are all distinctly different from one another and similar in style and makeup to the Y500 and Y510p, but now appear sleeker due to the much thinner profile. In essence, the Y50 is the complete opposite of a unibody chassis and carries a unique design and feel because of it. The aggregation of these very different materials that form the chassis has another drawback less commonly experienced by unibody designs. 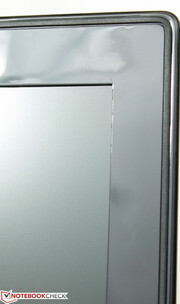 For one, there are more gaps between surfaces, especially around the back corners near the speakers. This theoretically leads to more areas that can potentially detach or break overtime compared to notebooks with just a single body frame. The right corner of our test model, for example, became detached from the honeycomb grilles during shipment, and the difference can clearly be seen when compared to the opposite left corner. Secondly, creaking is a bit more common when twisting the base or lid - again due to the more complex composition of the frame. Aside from the construction criticisms above, build quality is good overall. Pushing down on the center of the outer lid or bottom of the base result in only minimal distortions. Similarly, pushing down on the palm rests and center of the keyboard show visible, but again minimal distortions that are not a cause for concern. 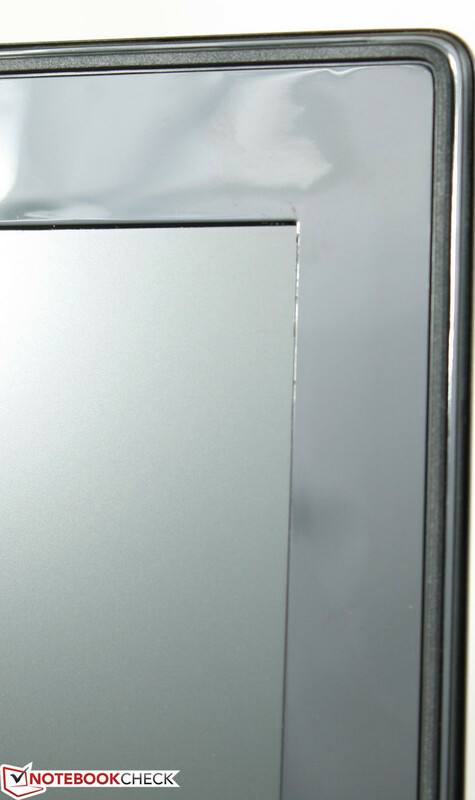 The single bar hinge is also rigid enough to prevent the monitor from shaking when typing and allows up to a 135 degree angle. 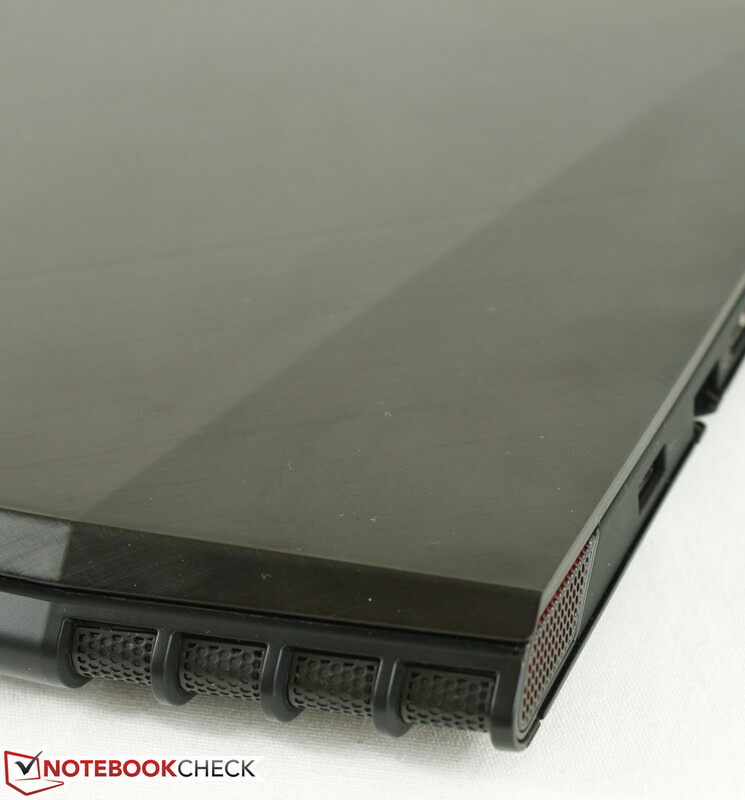 However, the overly glossy plastic display bezel and hinge appear budget-grade and tacked on compared to the classy brushed metal and matte rubber surfaces elsewhere on the notebook. 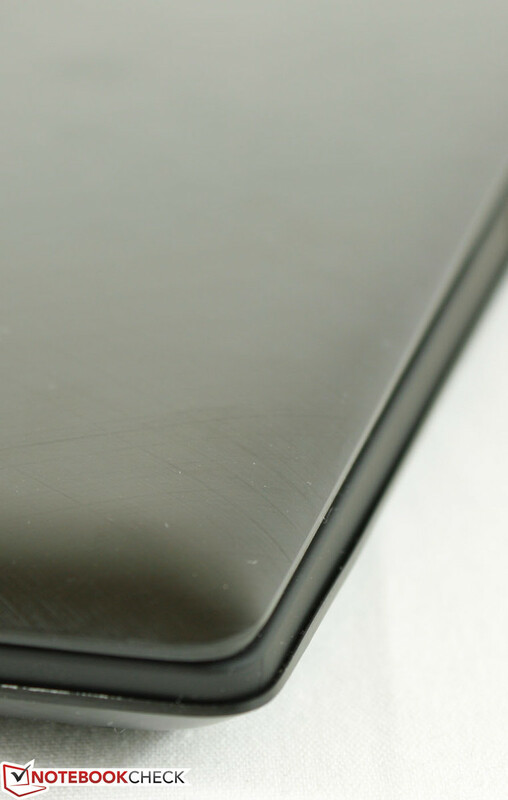 These particular plastic surfaces will also scratch more easily overtime. 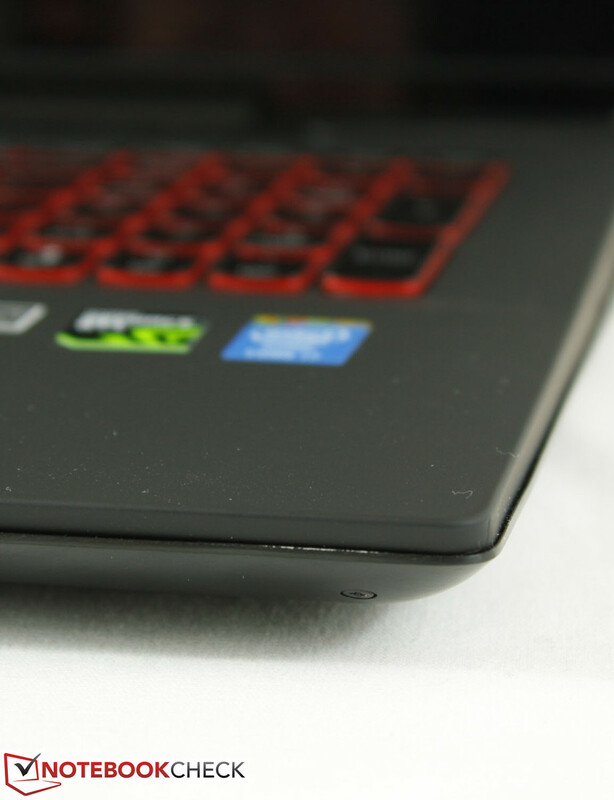 The thickness (23.9 mm) and weight (2.4 kg) of the Y50 are considerable improvements over the Y500 (39 mm, 2.93 kg) and compares favorably against the similarly equipped MSI GE60 (33 mm, 2.7 kg), but it still falls short of the sleeker and more expensive MSI GS60 Ghost (19.9 mm, 1.96 kg). The Lenovo is also a bit thicker and heavier than the competing Gigabyte P34G V2 and Razer Blade 14 as well, though these models are also much smaller in screen size to begin with. 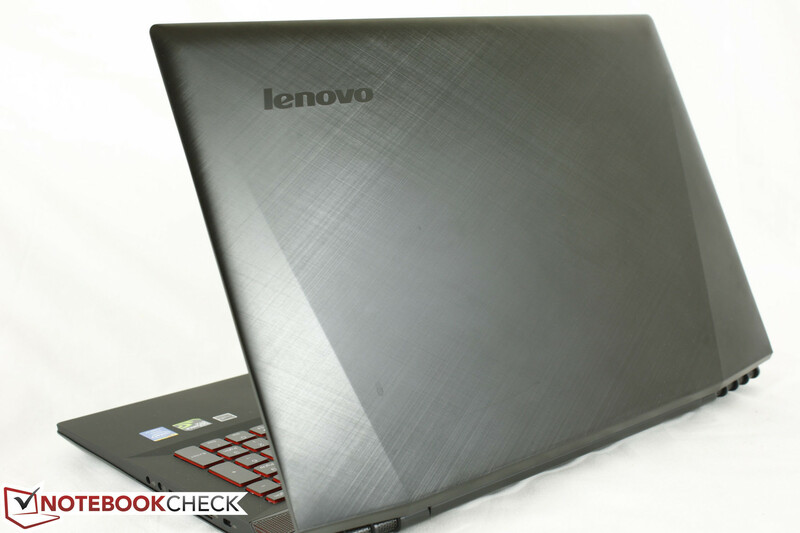 Considering that the Y50 is an inexpensive 15.6-inch gamer with a GTX 860M GPU, it's safe to say that Lenovo has designed an impressive notebook for the price. Available ports are similar to the Y500 with a notable omission. Aside from the absent UltraBay slot, legacy support via a VGA-out port has been dropped. Though likely a non-issue for the target audience, we would have liked to see DisplayPort added in to maintain the dual video-out option instead of relying on the sole HDMI port. Beyond that, the number of USB and audio options remain the same. Fortunately, positioning has been improved - These ports are now relegated nearer the rear of the notebook and away from the front edges to preserve desk space since the large side vent grilles are no longer present. Another small omission is the lack of Sleep-and-Charge despite having 3 USB ports. It's a minor complaint, but nonetheless a useful feature that we feel should be more common at this price range. WLAN is provided by an Intel Wireless-AC 3160 Mini PCIe card (up to 433 Mbps on ac network) with integrated Bluetooth 4.0. The card is dual-band in that it supports 2.4 GHz and 5 GHz networks, but cannot transmit both bands simultaneously as it is still a 1x1 class card. No other WLAN option is available and the card is certainly not in the same class as the Broadcom BCM4352 in certain Asus ROG models, though the Intel 3160 should be sufficient for gaming needs. We experienced no connectivity issues or random drops when connected to a wireless-n home network. Other radios such as GPS or WWAN are unavailable on the Y50. Such communication options are not expected on a notebook from this class. Dedicated accessories are nonexistent as the Y50 lacks any proprietary docking ports. Users will be limited to generic accessories and USB 3.0 docking ports. An external optical drive, for example, may be useful down the line. The standard one-year warranty applies, but this is Lenovo we're talking about, so expect a wider range of service options compared to competing manufacturers. Two-year and three-year extensions are available with accidental damage protection and in-home repairs starting at $50. The next tier up is their Premium Support, which covers diagnostics, malware, troubleshooting, and other issues on the software side. While the overarching chassis has received some notable changes, the AccuType keyboard has remained nearly identical to its last iteration. The sleek red motif, smooth plastic keys, two levels of red backlight, and Function commands have all carried over intact and are exactly where we remembered them. This isn't necessarily a bad thing as we found key placement and Function mappings quite useful in the Y500. One exception is the Lenovo OneKey Recovery button, which has now been relocated to sit next to the Power button. 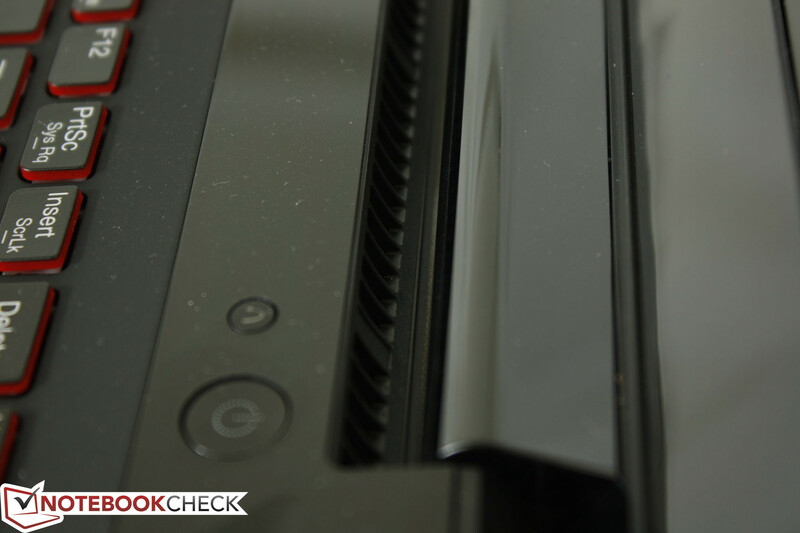 Nonetheless, we noted in our review of the Y500 and Y510p that the keyboard can be spongy and inaccurate. Unfortunately, these comments still apply here. 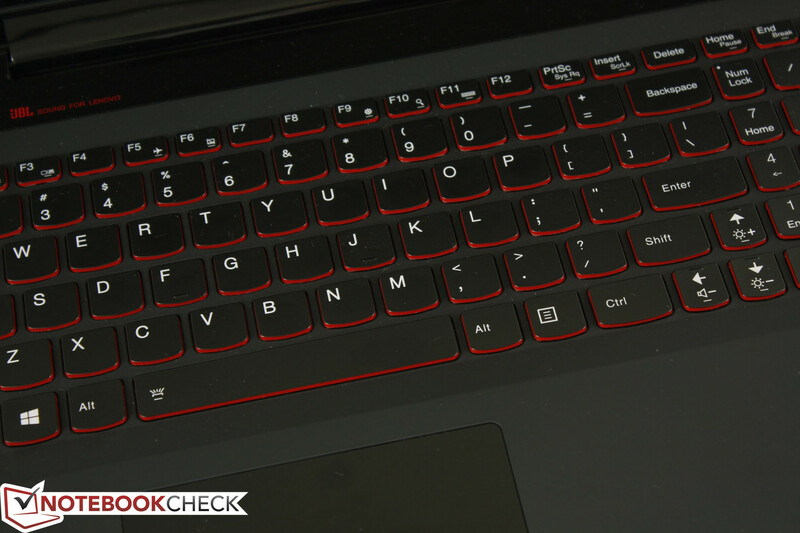 The keys are definitely not as spongy as on a Samsung Series 9 900X3C, but at the same time they are nowhere near as firm or satisfying as typing on an older ThinkPad with beveled keys. Typing inaccuracies generally solve themselves after becoming accustomed to the keys. The Space key, however, could certainly use improvement as it provides both shallow travel and unsatisfactory feedback when pressed. Note that the NumPad and Arrow keys are slightly narrower than the QWERTY keys due to space limitations. Thus, they do feel a tad more spongy in comparison when pressed. Dedicated volume keys are also missing. It would have been nice to have arrows on the WASD keys as well since this is common amongst gaming notebooks and keyboards, though this is purely cosmetic. Similarly, the large touchpad (106 x 70 mm) is unchanged. The Synaptics ClickPad V1.1 software still powers the hardware and allows for numerous customization options including edge swipes, palm tracking, scrolling, and multi-touch gestures up to four fingers. 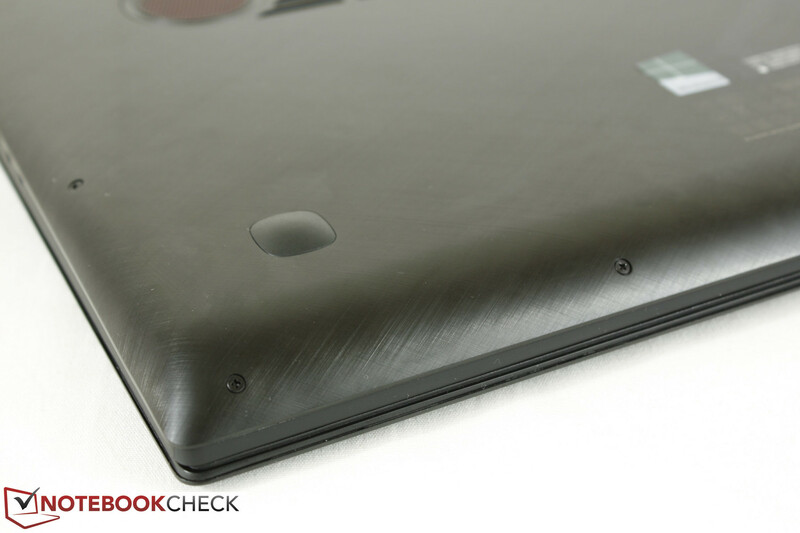 The actual touchpad surface is hard matte plastic (as opposed to glass on some ThinkPad models) and provides a smooth glide during use. 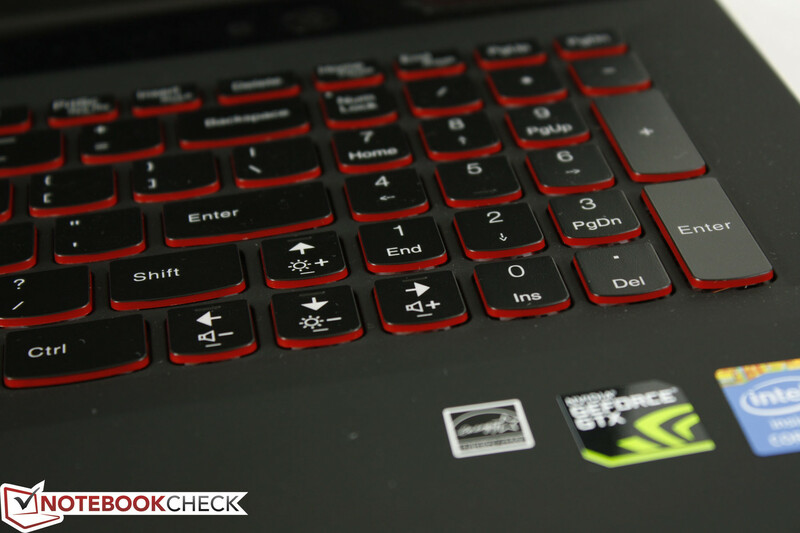 It also has no issues recognizing movement or even multi-touch inputs like zooming, which was an issue on the Y500. Mouse clicks are integrated into the touchpad and are unfortunately shallow in travel. 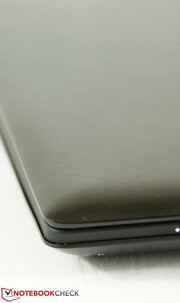 Clicking is possible only on the bottom half of the touchpad surface, which is common amongst larger touchpads. Tapping to click can still lead to unintended jumping of the onscreen cursor. This is certainly an aspect that could be improved in future models. 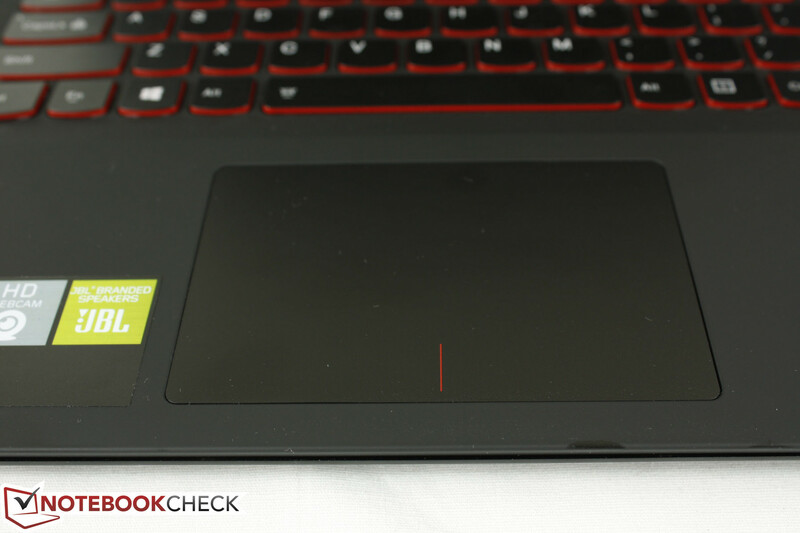 Though the touchpad is visually identical to the Y500, we did not experience any wobbling of the surface during regular use, which was a cause of much frustration on the previous generation. Aside from the shallow clicks, we found the touchpad to be pleasant to use for general navigation. Like the late IdeaPad Y510p, our Y50 utilizes a 15.6-inch 1080p matte display with no options for glossy or lower or higher resolutions. A separate Y50 UHD series is configured with 3840 x 2160 resolution displays starting for $250 more. This is similar to the 15.6-inch MSI GS60 Ghost which uses a much higher resolution glossy panel, though for nearly twice the price at retail. We certainly prefer the more standard matte screen on the Y50 as even the smallest glare from a glossy equivalent can be distracting while gaming. Subjectively, we find colors and text to be crisp with no noticeable screen-door effects or color noise when viewing from a normal distance. We measured an average brightness of 221 nits based on nine quadrants on the display, which is good for an indoor notebook. This is also a bit disappointing at the same time as most competing models have stronger LED backlights like the Gigabyte P34G v2, Aorus X7, Razer Blade 14, and even the older IdeaPad Y500 and Y510p models by a notable margin. Under standard lighting conditions, we found that anything below the 8/10 brightness setting to be too dim for comfortable viewing. In addition, the lower than expected contrast of about 300:1 is more budget than mainstream. We played The Dark Knight, which fittingly includes a large number of dark scenes, and found that dark areas are usually too gray and washed out to show intricate details. The same problem persists in games with dark or poorly lit areas. We measure color space reproduction with an X-Rite i1Display 2 calibrator and find color space to be average at best. 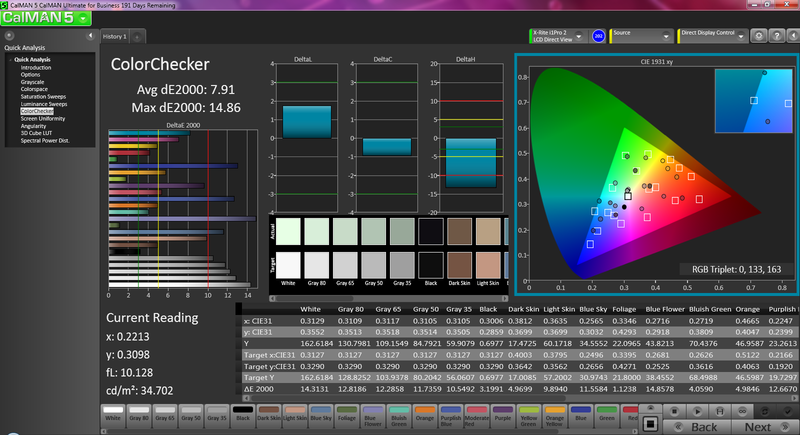 At only 34 percent and 49 percent of AdobeRGB and sRGB standards, respectively, the Y50 is certainly not made for professional graphics work or even color accuracy. 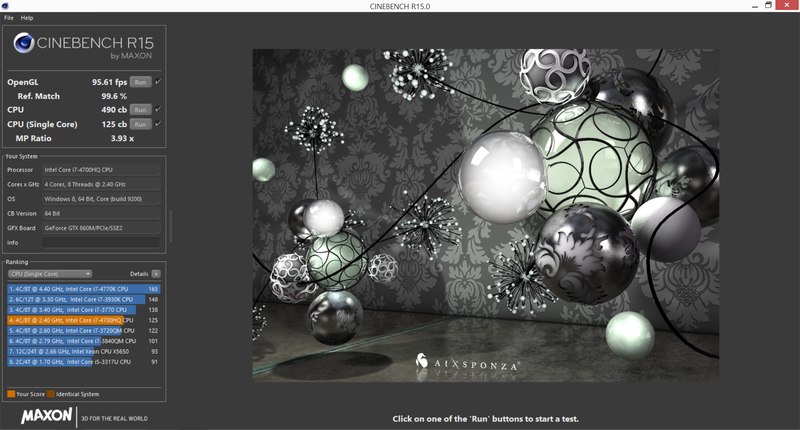 After just reviewing the workstation-class (and much more expensive) Eurocom X3, we can see that colors are not as deep by a slight margin on the Y50 in comparison. Fortunately, this means little to the target audience as the fast response times provided by a TN panel take precedence over color gamut when playing fast-moving games. 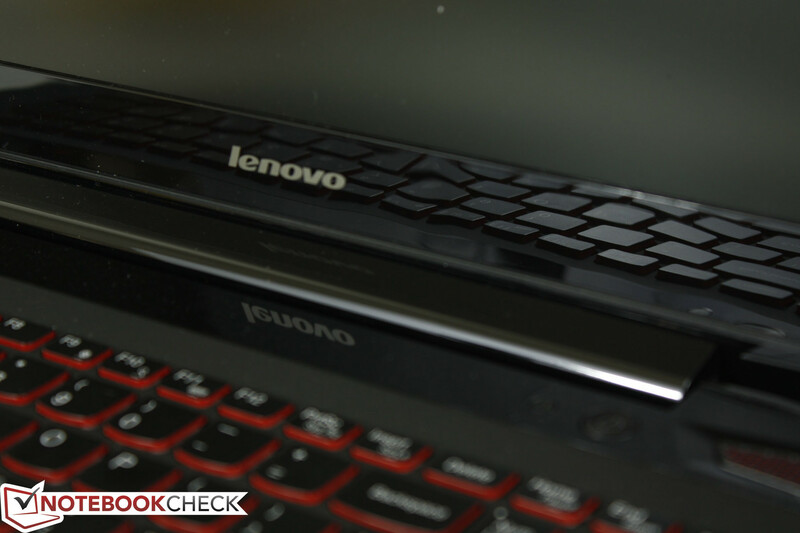 With that said, most competing models do cover wider color spaces than the Lenovo in review. 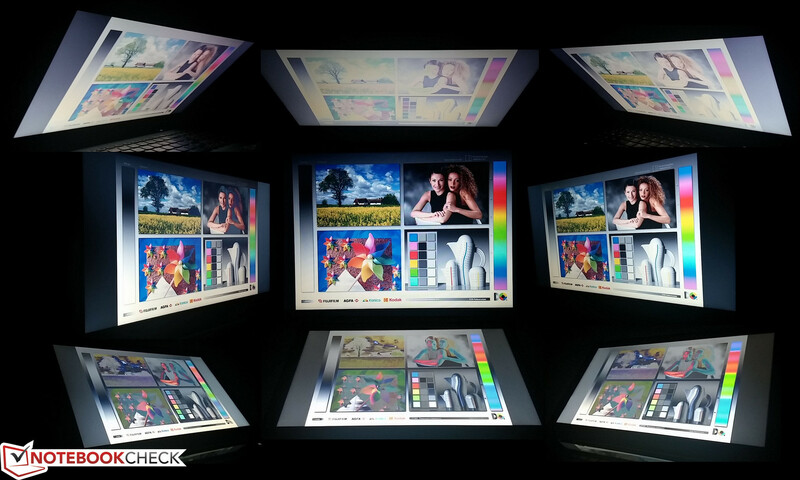 Further analyses with an X-Rite i1Basic Pro 2 spectrophotometer reveal inaccurate colors and poor RGB balance before calibration. Red, blue, and magenta are the worst offenders while green, teal, and yellow fare a bit better especially at higher saturation levels. 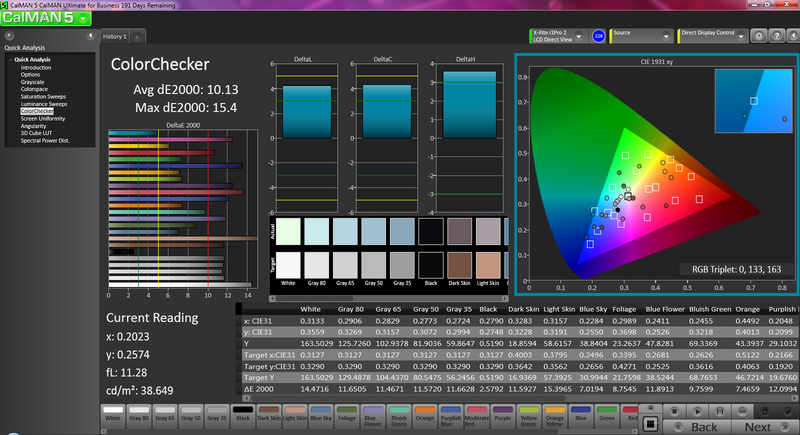 The high correlated color temperature of 10438K also show a very cool color temperature out-of-the-box. 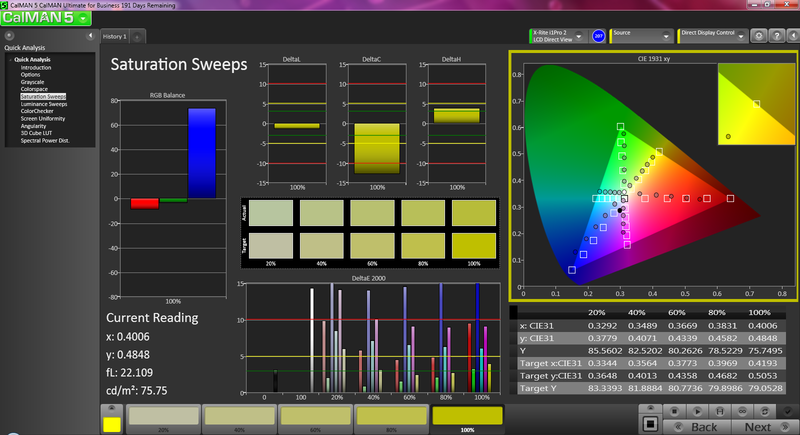 Calibration reduces these inaccuracies to a degree, but blue in particular sees very little improvement. 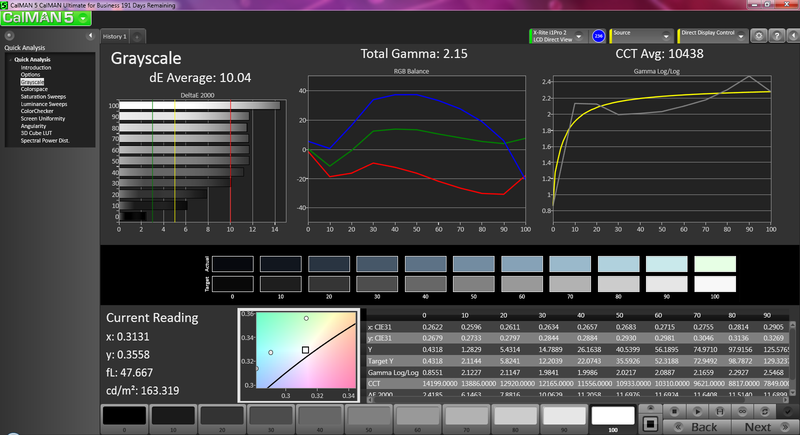 Grayscale also continues to be inaccurate at most levels with an average DeltaE deviation of 8.59 units. We stress that these intensive display measurements detract little from general web browsing, but it does suggest that some corners were cut on display quality to keep prices down. Outdoor usability is very limited. Maximum brightness will reduce by about 40 nits if running on batteries and, when combined with the already low contrast of the screen, will result in a quickly washed out display. We recommend working on the highest screen brightness level and under shade for better visibility. However, we still found ourselves squinting even under optimal outdoor settings. Viewing angle stability is similar to a budget TN panel. The optimum viewing window is quite low as even a standard straight view will result in washed out blacks near the top of the screen. This is most noticeable in dark scenes, but much less of an issue in brighter and colorful scenes. 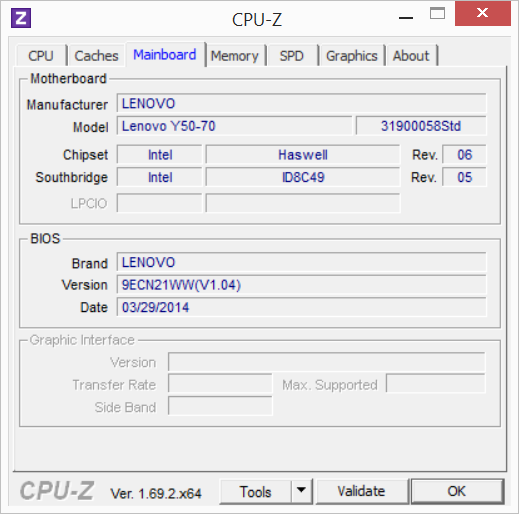 Lenovo offers just two CPU options with the Y50: an i7-4700HQ and an i7-4710HQ. Both are high-end quad-core Haswell options with minimal performance differences between them. 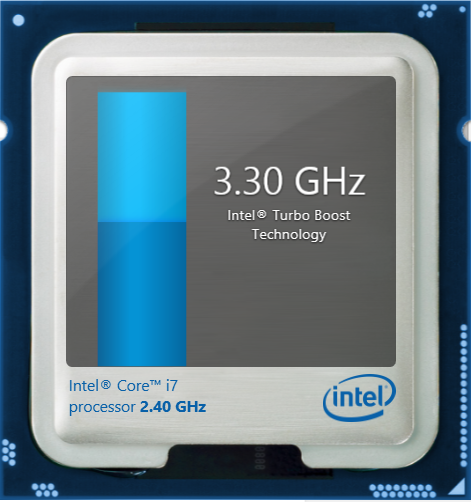 In fact, the latter i7-4710HQ model is only 100 MHz faster than the i7-4700HQ in base speed and Turbo Boost benefits; Everything else from cache to features are identical. The i7-4700HQ CPU in our test unit will run at 800 MHz on Power Saver mode and is equipped with an integrated HD 4600 for Optimus purposes. RAM is provided by two Samsung PC3-12800 modules for a total of 16 GB. Removing the panel underneath will reveal the HDD, battery, 2x SODIMM slots, mini PCIe WLAN card and both system fans. A set of dozen Philips head screws must be removed first, but we were still unable to pop out the panel despite following the official instructions to the word. It appears that our panel is stuck on the corners nearest the speakers preventing us from lifting it straight out. Of course, we will try again in our inevitable review update of this model. 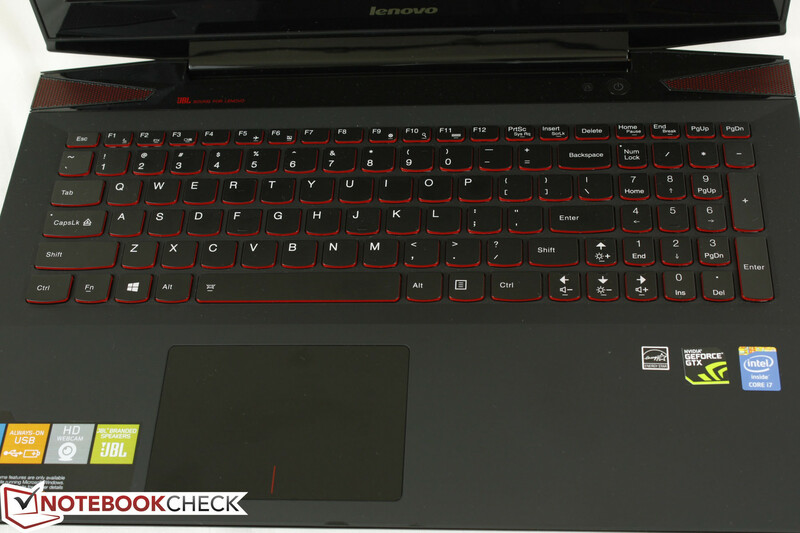 Nonetheless, Lenovo provides a very detailed manual for disassembly of the Y50 if required. 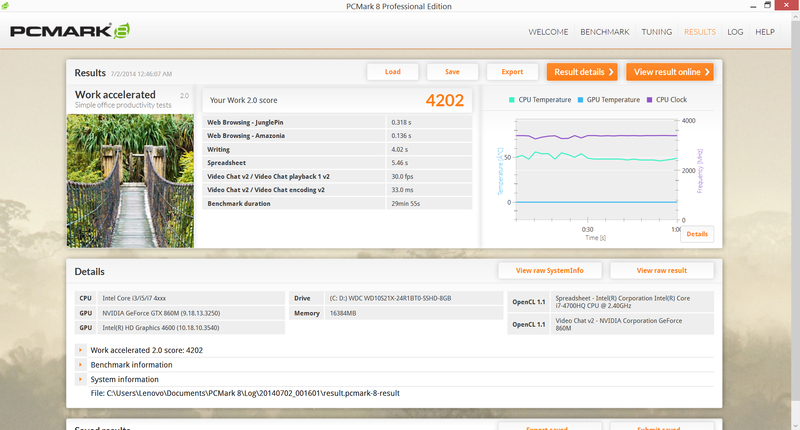 The i7-4700HQ in our model ranks similarly to other notebooks sporting the same CPU in most benchmarks. This includes the Asus N750JK and Gigabyte P34G V2, both of which sport similar dedicated GPUs. 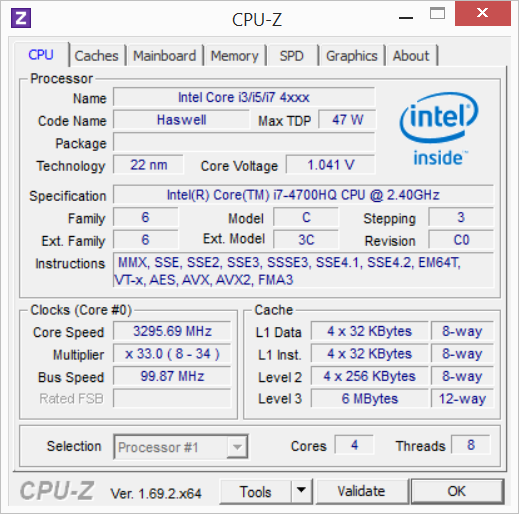 Unfortunately, the CPU is also on the low-end of the spectrum in certain benchmarks compared to other tested i7-4700HQ processors in our database. For example, our Ice Storm Physics score of 31331 points is at least 10000 points less than the next slowest i7-4700HQ in our database, while our 3DMark 06 CPU score is again at least 1000 points slower than the next slowest i7-4700HQ in our database. 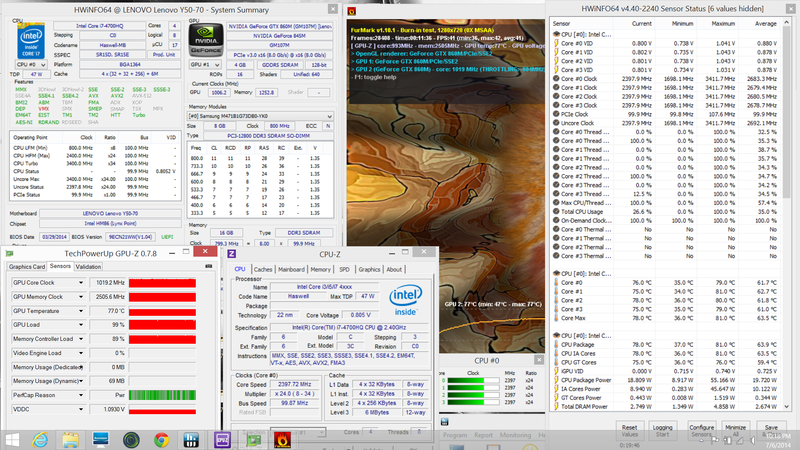 Multi-thread performance according to wPrime is about 100 seconds slower than the same CPU on the MSI GE70. 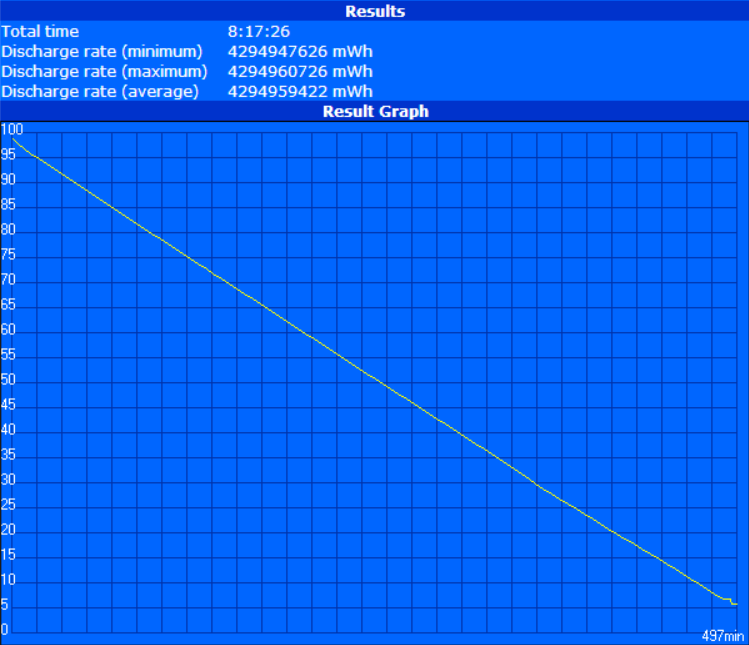 Single-thread performance according to Super Pi is the fastest of the lot, though only by a very small and essentially negligible margin compared to other i7-4700HQ CPUs in this particular benchmark. The lower-than-expected numbers in certain benchmarks may be explained by the weak Turbo Boost benefits of the CPU in the Y50. 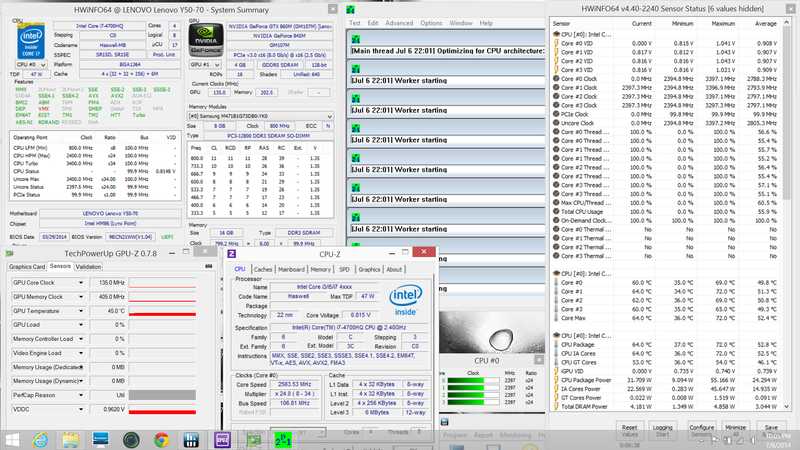 Clock rate drops quickly to its base 2.4 GHz when under high load as detailed in our stress test section below. 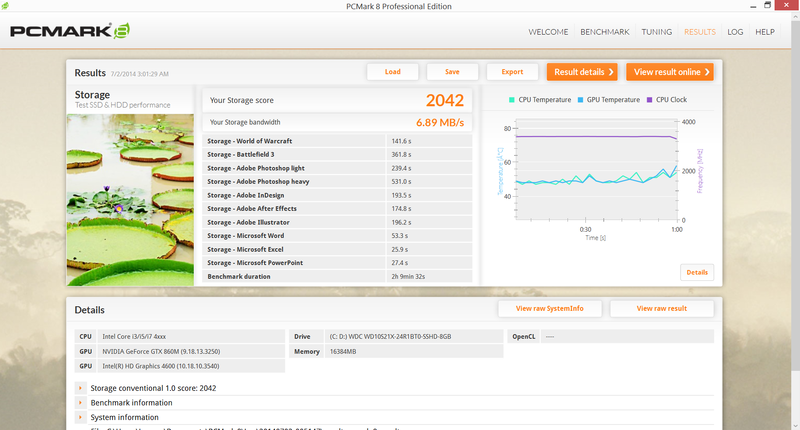 More benchmarks and information on the Core i7-4700HQ can be found in our dedicated CPU page here. 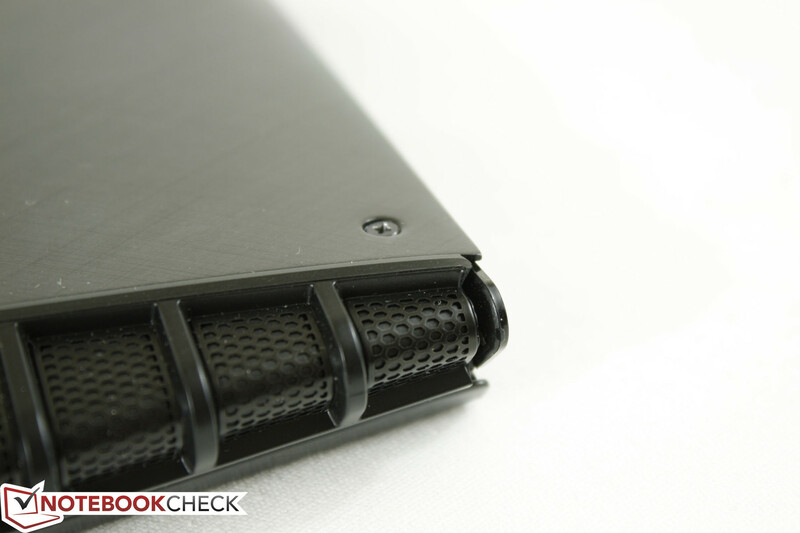 We stress the notebook to identify any potential throttling or stability issues. With Prime95 active, the CPU was observed to be operating at its maximum Turbo Boost for literally only a few seconds before stabilizing at its base speed of 2.4 GHz. In fact, Turbo Boost benefits are extremely short-lived on the Y50, which may explain some of the lower scores in select CPU benchmarks. 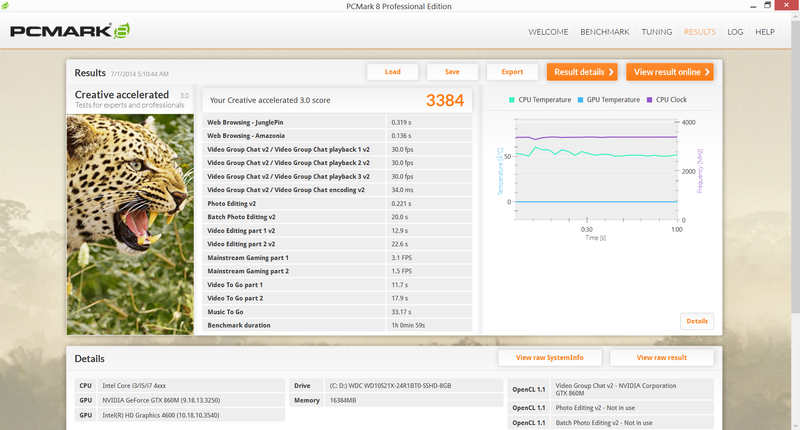 CPU temperature barely rose higher than 60 degrees C.
With FurMark active, the Nvidia GPU was able to maintain a memory clock of 2505.6 MHz and a core clock ranging from 1006 MHz to 1045 MHz according to GPU-Z. 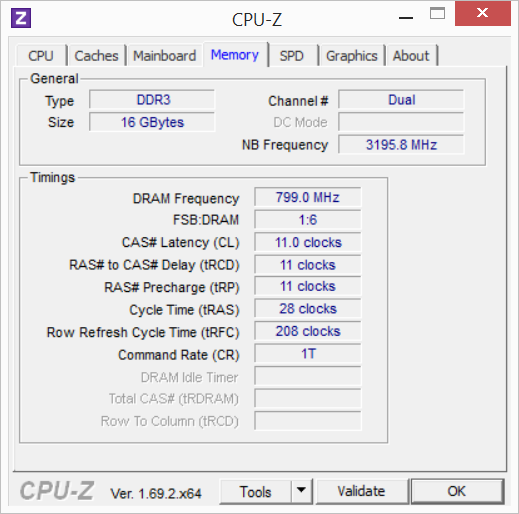 This is in the range of its stock clock rate of 1029 MHz with only a very minimal Turbo Boost in effect. Compared to the CPU, the GPU was operating at much higher temperatures of around 80 degrees C and with louder fan noise to boot. 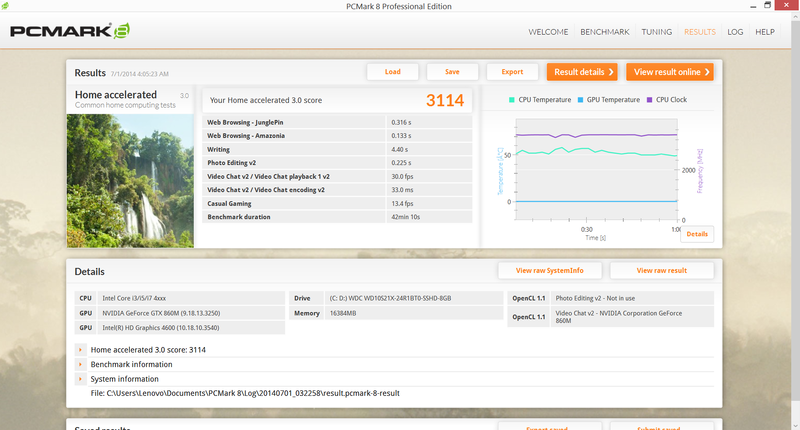 With both Prime95 and FurMark active simultaneously, the CPU and GPU were both observed to be operating at the same stable 2.4 GHz and 1006 MHz to 1045 MHz range, respectively. 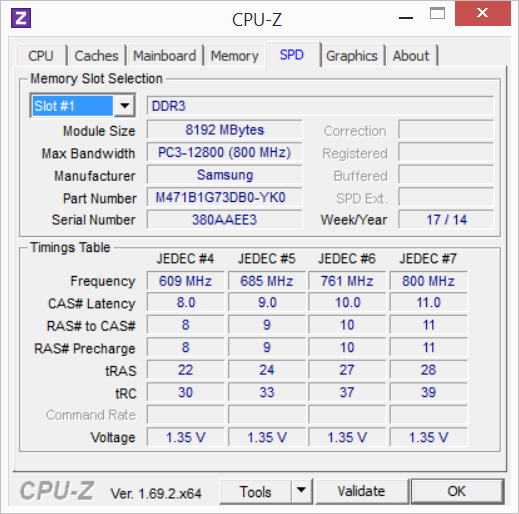 The GPU core would occasionally dip to 993 MHz before jumping back up to its usual speeds. 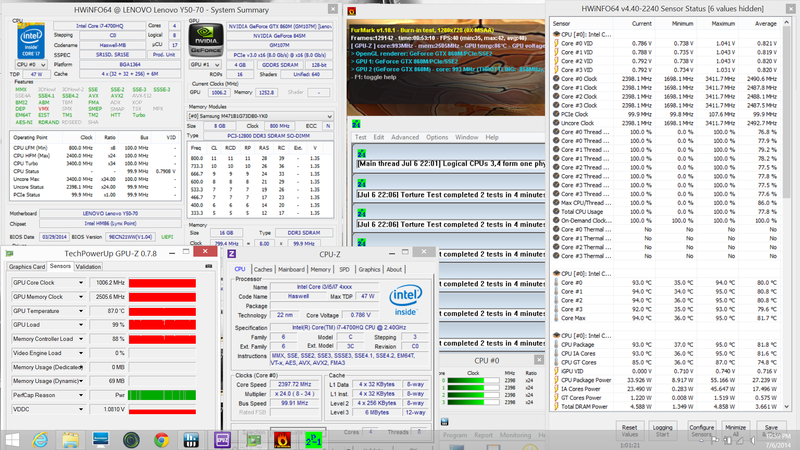 After an hour of full stress, CPU and GPU cores leveled out at 90 degrees C and 85 degrees C, respectively. 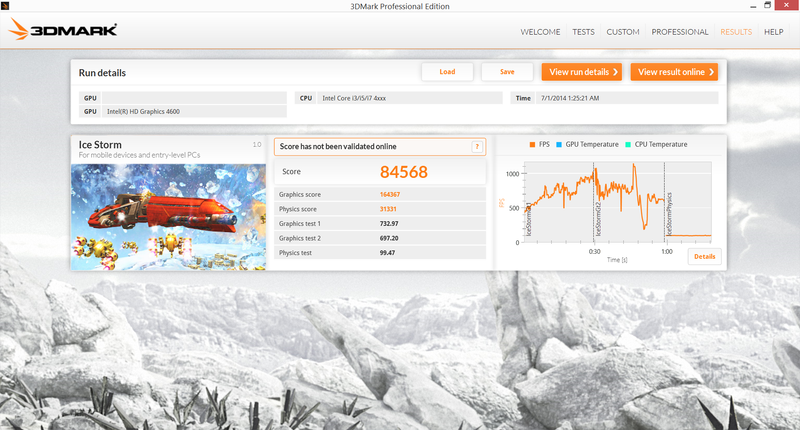 A 3DMark 2013 Fire Strike HD run immediately following the stress test reveals no drops in final scores to confirm no throttling issues. Unfortunately, running on batteries will reduce overall performance. A 3DMark 11 run on battery power returned a CPU and GPU score of 4175 and 3913 points, respectively, compared to 6232 and 4904 points when connected to mains. 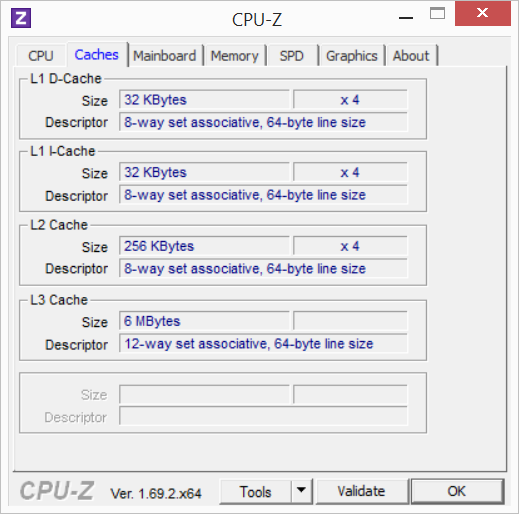 With HWiNFO and GPU-Z monitoring tools, the CPU can be observed to be operating at a very wide 800 MHz to 2.4 GHz range (with very short Turbo Boost) instead of a steady clock rate. Meanwhile, the GPU operates at a much lower core clock range as well between 405 MHz and 548.6 MHz. 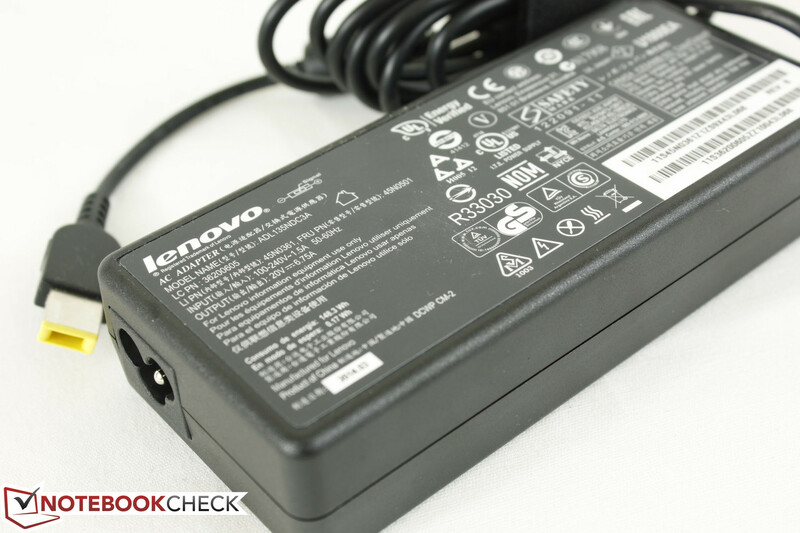 Slower speeds on batteries are a common occurrence on gaming notebooks, so AC power is recommended when gaming. 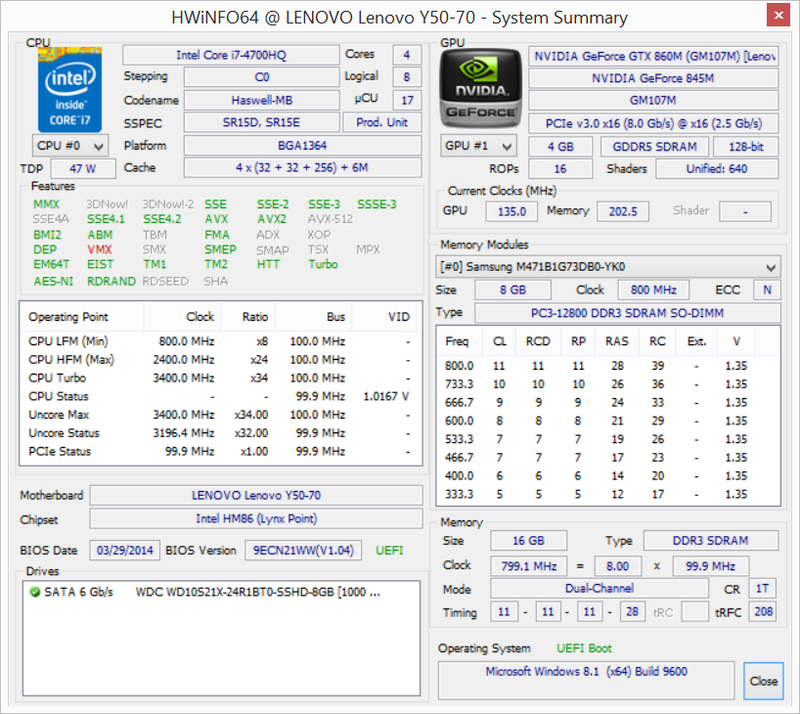 PCMark 7 scores are similar to notebooks with inferior integrated GPUs like the Lenovo Carbon X1 Touch due to the slow SSHD of the Y50 when compared to SSDs. 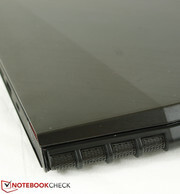 Indeed, its final score of 3006 points shows that the notebook is hindered by the mechanical drive as the similarly equipped Gigabyte P34G v2 scores 5400 points in the same test with its Lite-On SSD. 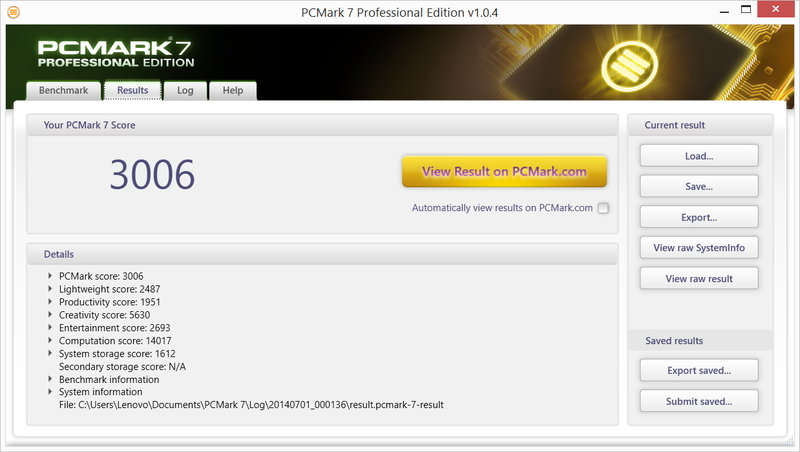 Likewise, PCMark 8 scores show similar results. Theoretically, hybrid drives should offer SSD-like performance for frequently used applications. We ran PCMark 7 three times in a row to observe possible score increases, but the final run only resulted in a negligibly higher score of 3066 points. Subjectively. simple navigation and launching of applications still feel as if the notebook was running from a standard HDD. 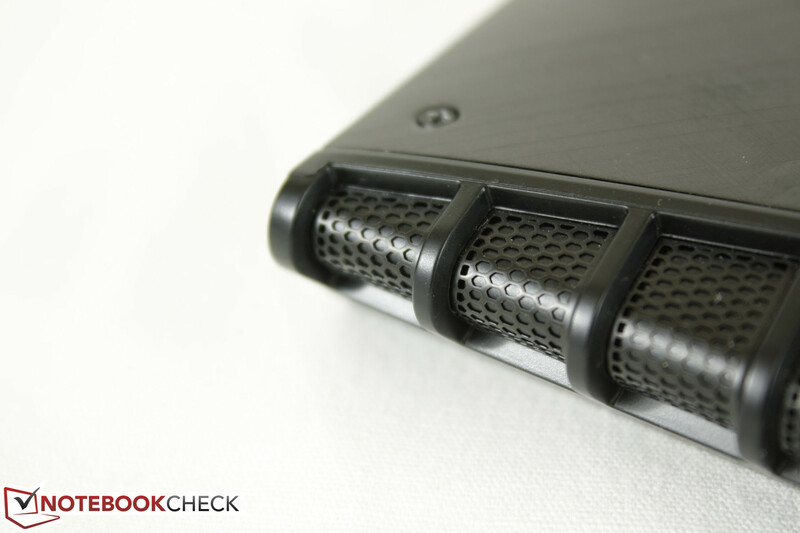 Our test model uses a Western Digital WD10S21X SSHD with 1 TB of storage and 8 GB of SSD cache. 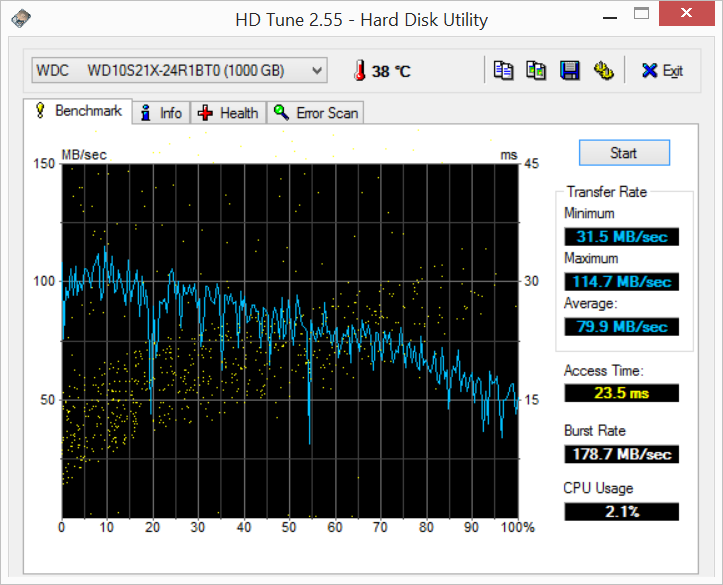 Unfortunately, the 5400 RPM drive is rather slow with a transfer rate of just 79.9 MB/sec according to HD Tune. Faster 7200 RPM drives, such as the Hitachi drives in the HP Envy 15 and ThinkPad T431s, can have transfer rates well above 90 MB/sec in the same benchmark. In fact, we noticed plenty of texture pop-in in some titles like Guild Wars 2 during benchmarking that would not normally occur. 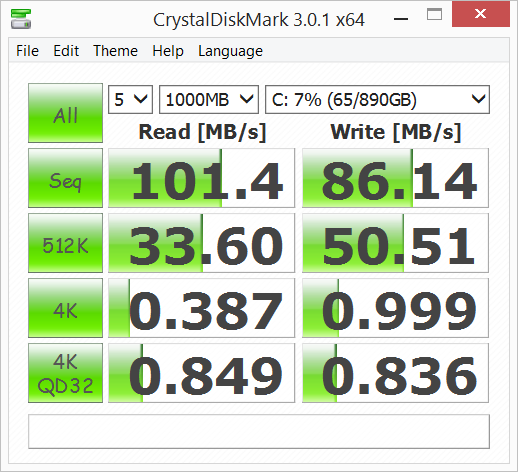 Crystal Disk Mark scores also show generally lower numbers across the board when compared to a more standard 7200 RPM HDD. Luckily, the primary drive can be replaced with another 7 mm solution. There are no additional SATA or mSATA options for secondary or RAID storage, however, so a high SSD capacity is recommended if solid-state storage is desired. For more benchmarks and information on individual models, see our growing HDD/SSD list here. Though all Y50 models include a GTX 860M GPU, there are two different 860M models available - a GM107 model based on the newer Maxwell design and a GK104 model based on the older Kepler design. 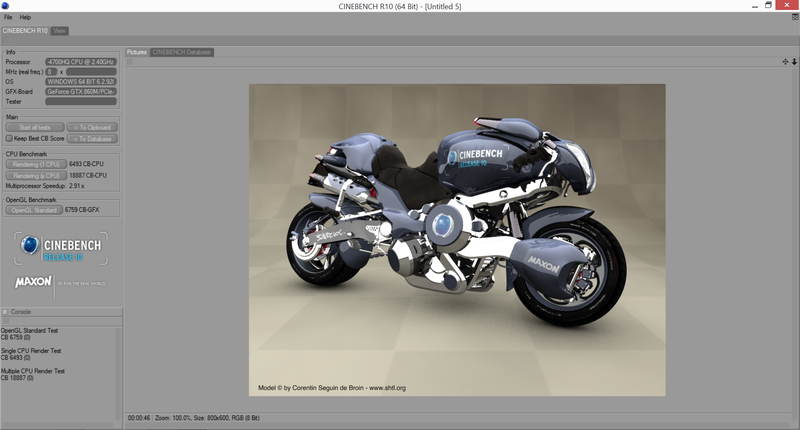 Both cores differ greatly in clock rate, bandwidth, and shader units. Consequently, the older Kepler variant is about 10 percent slower than the Maxwell model. We highly suggest choosing a Y50 model with the Maxwell GPU as a result. 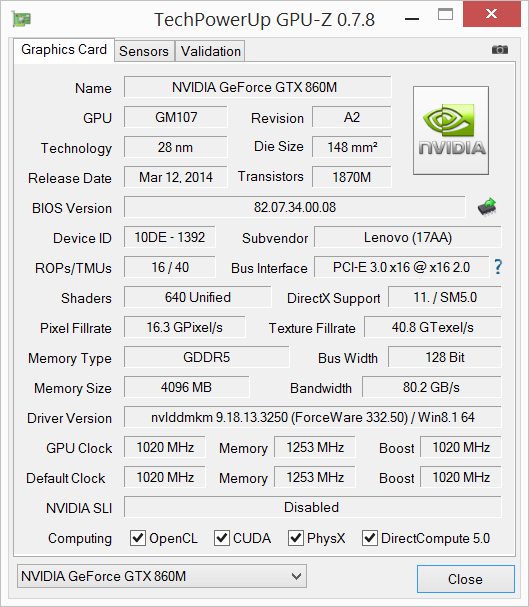 More information, benchmarks, and differences between the two GTX 860M models can be seen in our dedicated GPU page here. Our test unit uses the 860M from the newer Maxwell family with 640 unified shaders and a 128-Bit memory bandwidth. Compared to the Kepler generation, the GPU is most similar to a high-end GTX 770M in most cases. Synthetic benchmarks like 3DMark 11 place our Y50 right next to larger gaming notebooks including the Asus G750JX and iBuyPower Valkyrie CZ-15. 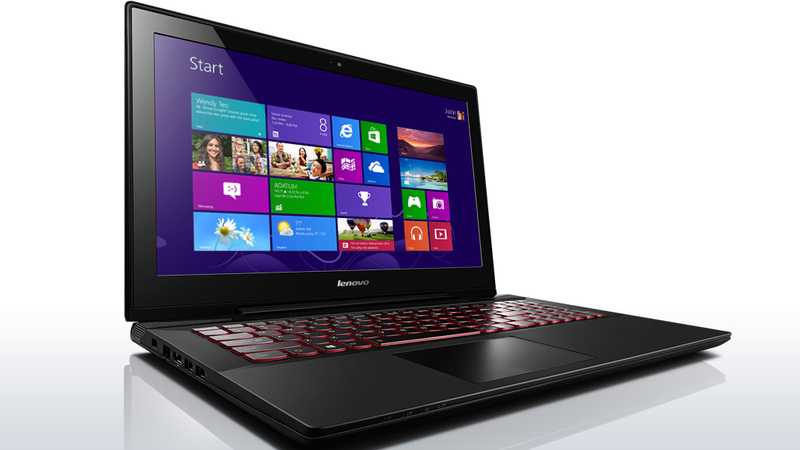 Does a single GTX 860M outperform the 650M SLI and the 750M SLI in the IdeaPad Y500 and Y510p, respectively? Aside from the inherent advantage of no micro stutters, the 860M solution performs noticeably better in Sleeping Dogs (20 FPS vs. 14 FPS) and Guild Wars 2 (31 FPS vs. 23 FPS) than the 650M SLI solution in the Y500. The performance gap is less clear-cut against the 750M SLI solution in the Y510p as the latter is faster than the Y50 in both titles above, yet performs slower in GRID 2 (37 FPS vs. 45 FPS) and Metro: Last Light (24 FPS vs. 28 FPS). Especially if playing on higher settings where FPS tend to be lower, we much prefer the less complex and less power-hungry single GPU solution to avoid stuttering and other potential SLI issues. 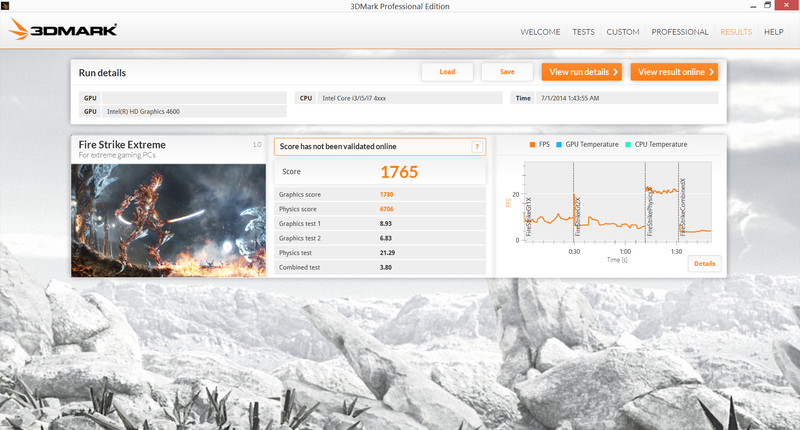 The solid performance from our GTX 860M is enough to play most titles on maximum settings at a locked 1080p30. A handful of more demanding games like Sleeping Dogs, Metro: Last Light, and the recently released Thief may need some settings turned down slightly for more fluid gameplay. Note that a current bug in GRID: Autosport prevents running the application in fullscreen; we had to fix the issue manually by editing the hardware_settings_config.xml file before recording our benchmark numbers. The Y50 is cooled by two system fans - one small fan for the CPU and one slightly larger size for the GPU - each with its own heat sink. The dual fan system is commonly found on larger high-end gaming systems like the Asus ROG series or most Clevo barebones. In this case, the two fans do little to reduce system noise on the Lenovo. Its Power Saver idling fan noise of about 33 dB(A) is a bit louder than the Y500, Y510p, and Aorus X7, all of which have dual fan systems as well. Idling while on High Performance mode will increase idling fan noise to about 36 dB(A). Under higher loads, both fans will increase in speed linearly instead of in a stepwise manner. 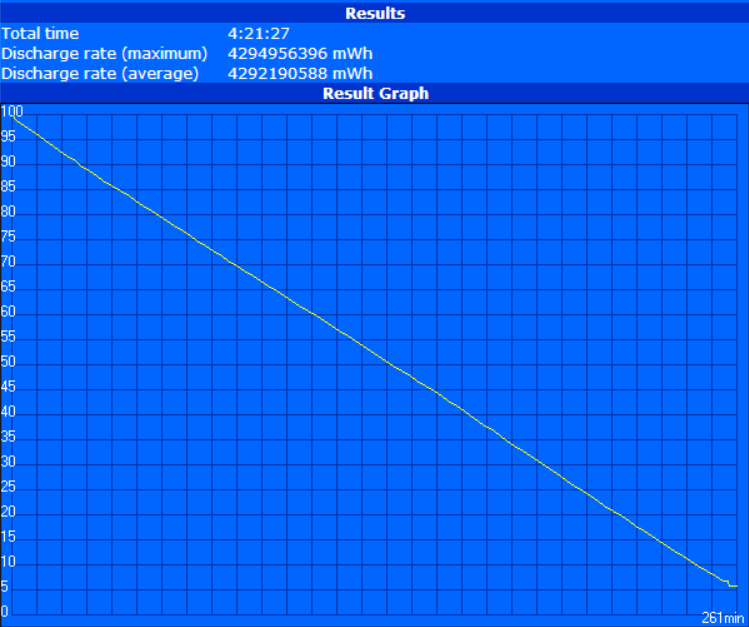 We were able to record a maximum of 49.8 dB(A), which can be a distraction to the user. This was measured under unrealistically high loads, however, so gamers will typically experience fan noise in the somewhat more manageable 40 to 45 dB(A) range instead. 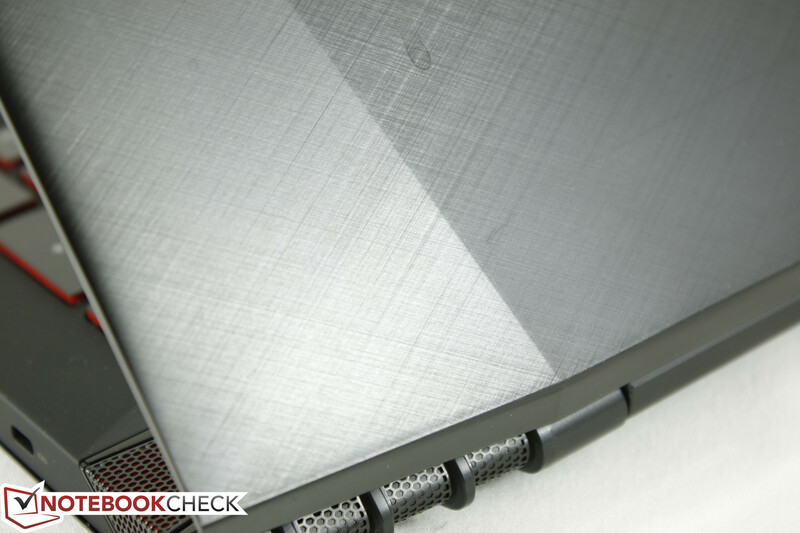 Idling temperatures are flat across the board on both the top and bottom surfaces of the notebook. They are also quite low compared to the Y510p where we measured much higher averages under similar conditions, likely due to the lack of Optimus on the older model. This ensures a comfortable typing experience on the Y50 assuming light or medium workloads. Our load temperature measurements were performed after an hour long of full CPU and GPU stress, so most users will not encounter our extreme numbers during everyday use. However, expect some sweaty palms after longer gaming sessions. (-) The average temperature for the upper side under maximal load is 45 °C / 113 F, compared to the average of 32.9 °C / 91 F for the devices in the class Gaming. 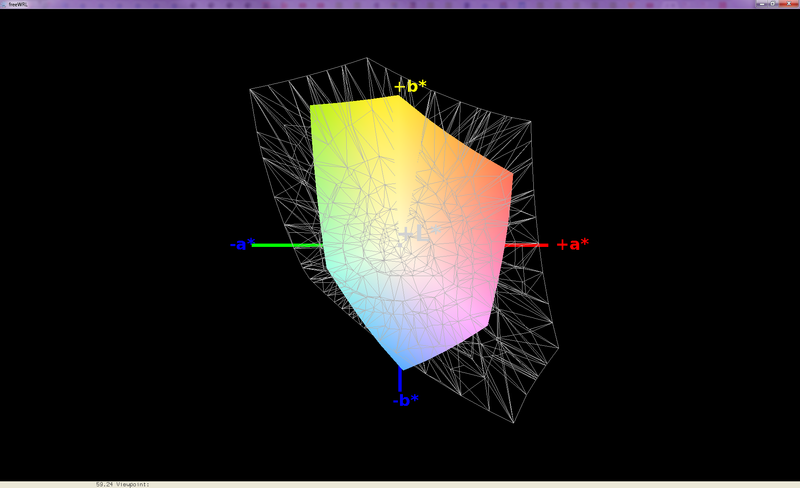 (-) The maximum temperature on the upper side is 60.4 °C / 141 F, compared to the average of 39.3 °C / 103 F, ranging from 21.6 to 68.8 °C for the class Gaming. 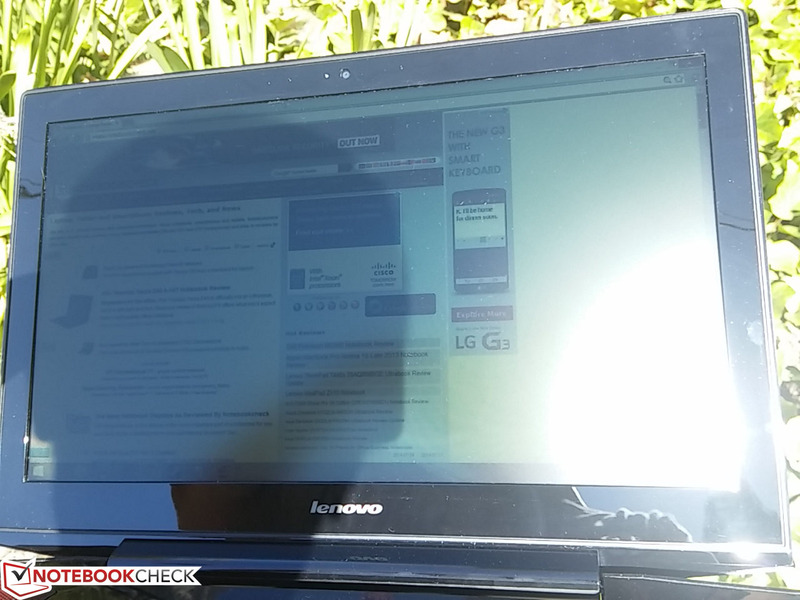 (-) The average temperature of the palmrest area of similar devices was 28.7 °C / 83.7 F (-6.5 °C / -11.7 F). Audio is provided by two JBL speakers plus a subwoofer on the bottom of the unit. Sound quality is very good with no distortions or static at higher volumes. Maximum volume is also quite loud with relatively balanced treble and bass for a notebook. Dedicated external solutions will almost always have the performance advantage, of course, but the internal speakers are perfectly acceptable. 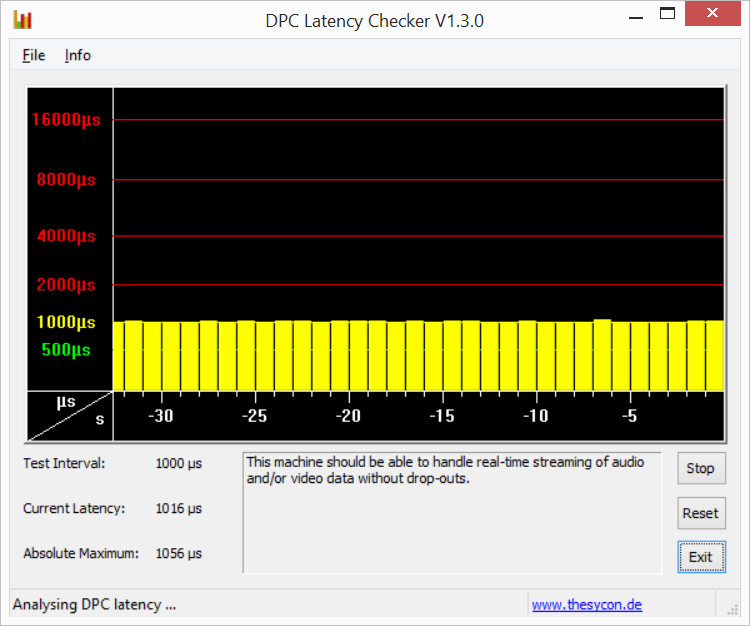 The Dolby Digital Plus V2 software provides an equalizer and several customizable settings for movies, music, games, and voice. Available options are not as involved as say the software equivalent from Sound Blaster, though they are much easier to use here. All Y50 models come equipped with a 4-cell 54 Wh integrated battery; No other capacities are offered. While the Li-ion module itself is removable underneath the maintenance panel, it cannot be quickly swapped. 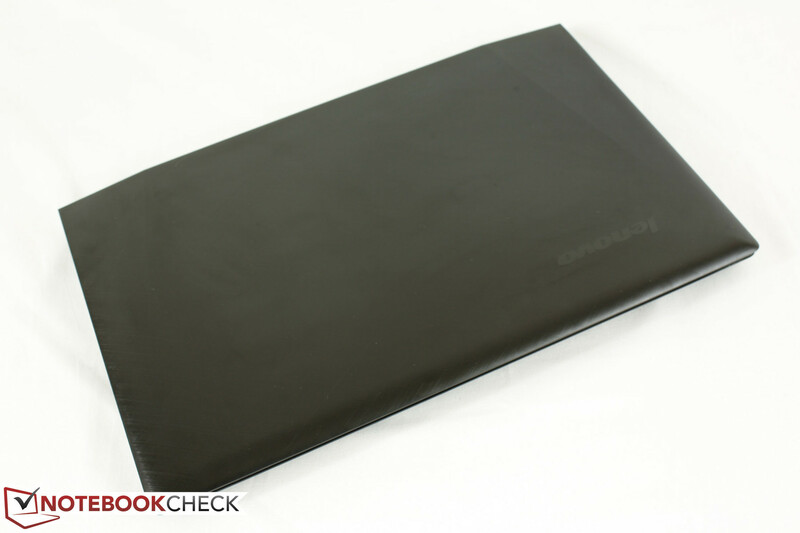 Lenovo advertises a battery life of up to 5 hours. Our own tests with the Battery Eater Reader's Test reveal a runtime of over 8 hours, though this is with the system idle at minimum screen brightness with wireless radios disabled - hardly a realistic representation. Our more real-world WLAN test sets the notebook at 150 nits with an open browser running our looping script to simulate web surfing. At almost 4.5 hours of constant use, we may have been able to get closer to Lenovo's own estimates by lowering the display brightness even further. Battery life is a significant improvement over the Y500 and Y510p, both of which have denser battery modules at 72 Wh and 62 Wh, respectively. These models do lack Optimus due to their SLI configurations, so a straight comparison may not be proper. 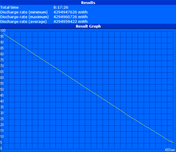 A more leveled comparison is to the Gigabyte P34G V2, which the Y50 comes very close to in terms of average runtime. 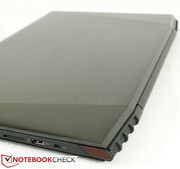 The more powerful MSI GS60 Ghost falls short of the Y50 despite having a larger 52 Wh battery and a similar screen size. 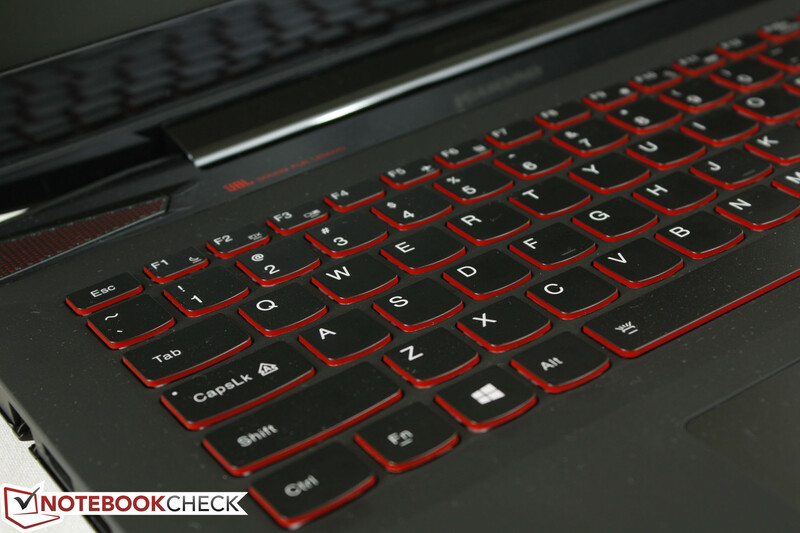 Overall Battery life is respectable for a powerful gaming notebook. 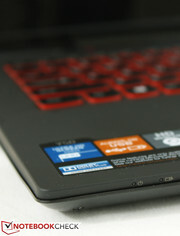 IdeaPad models have always excelled in affordability. The Y Series in particular combines high performance with affordability in attractive cases to appeal to as wide of a gaming crowd as possible. This means that some corners have to be cut and the Y50 is no different in this regard. 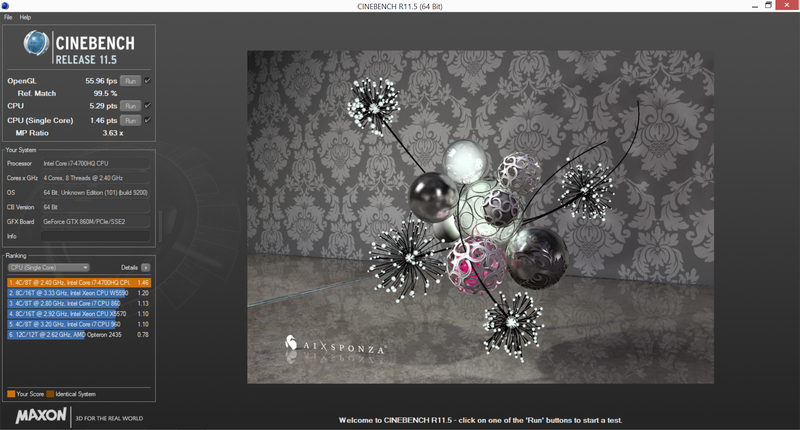 While the CPU is good and the GPU is even better, some physical qualities feel average at best. Firstly, the budget 1080p panel exhibits poor contrast and colors. Combined with the narrow viewing angles, dark scenes in games and movies can look washed out and users may find themselves tilting the display forward for a better view. The glossy plastic bezel also feels out of place compared to the more high quality brushed metal exterior and rubberized matte palm rests. While these cutbacks may be acceptable for budget notebooks, they have no place on a $1000 portable gaming rig. The AccuType keyboard keys, while visually attractive especially with the red backlight on, provide too light of a feedback when pressed. 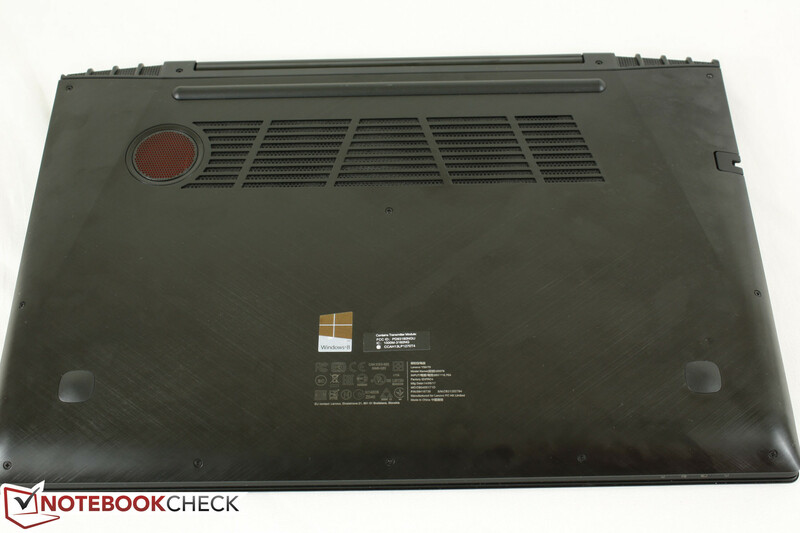 Surface temperatures can also become much warmer compared to competing notebooks. Performance from the 5400 RPM hybrid drive feels slow, though this is fortunately upgradeable. However, the lack of secondary storage (no mSATA slot) limits most cost-conscious consumers to only HDD solutions in order to accommodate large game installs. Some other negative aspects of the system, such as the difficult-to-remove battery and reduced maximum brightness if not on mains, are less important factors considering that the notebook is meant to be played indoors with an available AC outlet nearby. For the price, the Y50 still offers great performance for gamers. For everyone else, however, we feel that an Ultrabook will offer better application performance and outdoor usability, while a multimedia notebook will offer deeper contrast levels and connectivity options for better movie playback and casual gaming for lower prices. Nonetheless, this is one of the least expensive 15.6-inch notebooks with a GTX 860M GPU as of this writing. Users intending to jump in are encouraged to upgrade to a high-capacity dedicated SSD sometime down the line for dramatically improved performance outside of gaming. 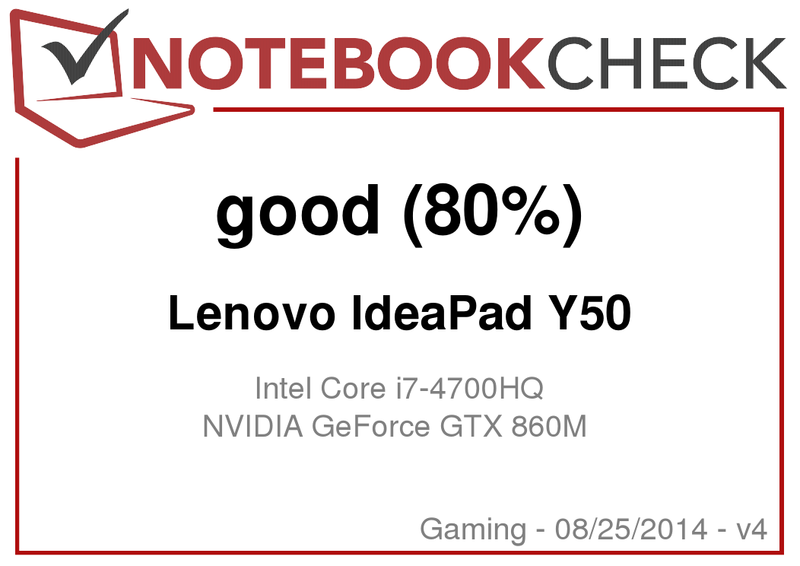 The price of the Y50 may be hard to beat, but hopefully the standard TN display will be improved in the next iteration so we can quickly recommend this IdeaPad to gamers on a budget. 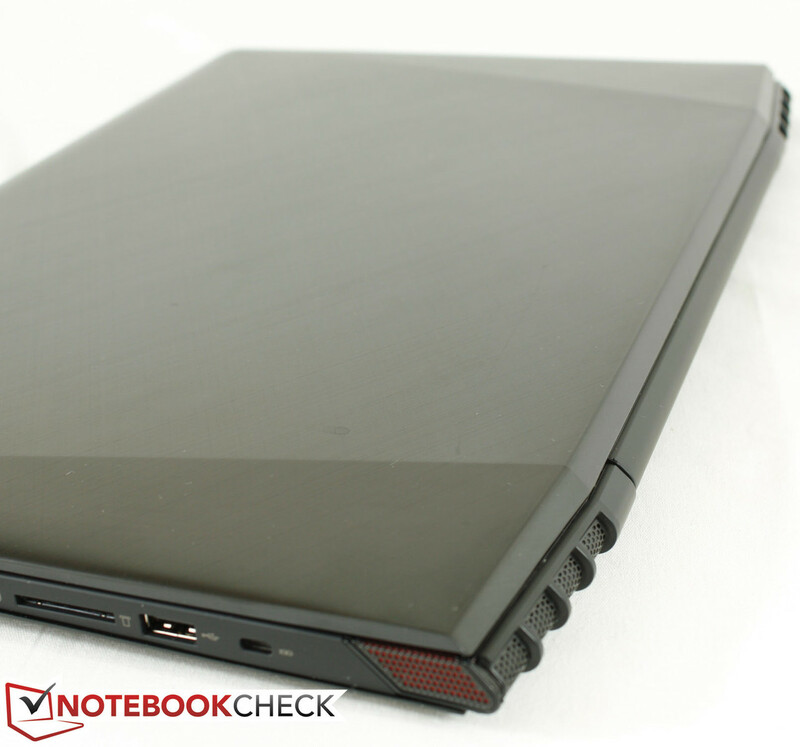 Inexpensive, yet attractive gaming notebook with a powerful GTX 860M GPU. IPS display options or at least an improved TN panel that better reflects the $1000 price tag. Dedicated volume and brightness keys. Removal of the glossy plastic bezel. Optimus support provides good battery life. Stylish chassis holds up well against Razer, Aorus, and MSI ultrathins.